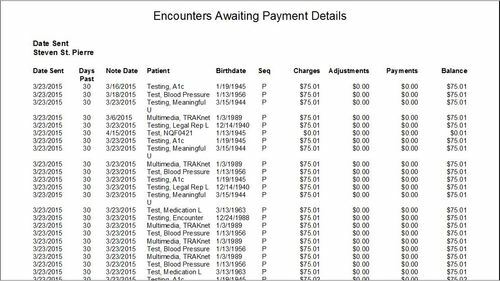 The Encounters Awaiting Payment report is a standard billing report found under the Billing Dashboard, in Reports.This report will show you any Encounters that have charges that have been submitted to insurance and are still awaiting a payment. Summary – an overview of the total charges still waiting for an insurance payment, showing the total submitted, current adjustments and payments made on those charges and the remaining balance. Detailed – lists every Encounter. 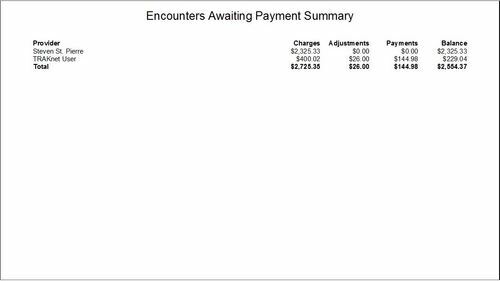 For each Encounter, it will list the day that the claim was sent to insurance, how many days it has been since then, the date of the note, the patient, their birthdate, the current insurance you are waiting for payment from, the total amount billed out, any payments or adjustments made and the current balance. Claim Date – only Encounters where the current insurance sequence claim was sent out during the specified date range will be included. Days Past Submission – only Encounters for which the specified number of days have passed since the current insurance sequence was sent out will be included. Insurance – only Encounters that are waiting for a payment from the specified insurance(s) will be included. Note Date – only Encounters where the Encounter date is in the specified date range will be included. Show Submitted Charges – if “True” is selected, only charges that were actually sent to insurance will be included in this report. Charges that were not sent will not total in. Show Patient Responsible – if “True” is selected, patient responsible charges will be included in this report. If set to “False”, they will be left out. This filter will combine with the Submitted Charges filter. Locations – only the Encounters that are set to the specified location(s) will be included. Provider – only the Encounters that are set to the specified provider(s) will appear. Please note that this report references the claim history of the Encounter. If you send the claim again and do not delete the previous claim history, your amounts will double.